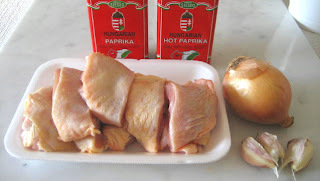 Beside Hungarian Beef Goulash this must be best known Hungarian meal. It is just too bad that I can’t have it more often because it is so obscenely rich. And because of that, is it ever tasty! Original recipe calls for whole chicken cut up. 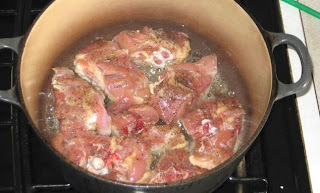 I use chicken thighs that I consider the very best part of the bird, there is so much flavor and it can be cooked in so many ways from soup through BBQ to slow stewing. Paprika Chicken is just that, a stew. 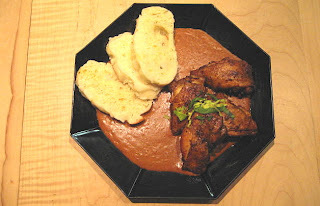 It can be served with noodles, rice or potatoes but back in Czech Republic we always had bread dumplings. They really soak in that wonderful rich sauce! 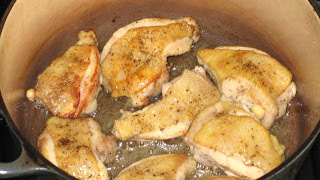 To serve 2 with leftovers J.
Pat the chicken pieces dry with paper towels and salt and pepper generously (I always brine my chicken so I skip the salting). In a Dutch oven heat the lard or oil until light haze forms over it. Add the chicken pieces skin side down and shallow fry them till golden brown, about 3 minutes. Remove to a bowl and pour off all the fat, leaving only a thin film. Lower the burner to medium heat and add onions and garlic and sauté until lightly colored. 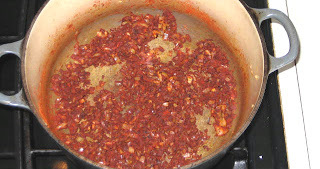 Remove from heat and mix in sweet and hot paprika until the onions are well coated. Return to heat and add chicken stock and bring to boil. Return pieces to pot, cover and place on middle shelf in oven. After one hour the chicken should be fall-off-the-bone tender. Remove from oven. In a mixing bowl with wire whisk mix the sour cream and flour until smooth and then add about a cup of hot sauce into sour cream to temper it. 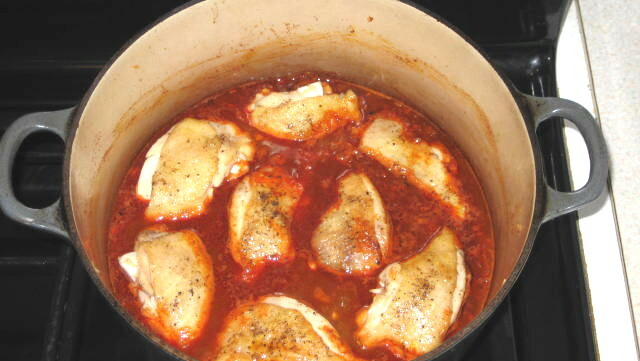 Stir the mixture back into pot, return the chicken with all accumulated juices to the pot and bring it slowly to simmer. Do not boil or the sauce will separate! 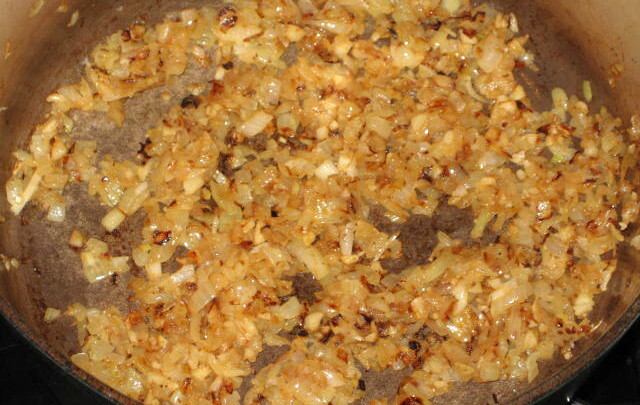 After 3 minutes remove from heat and serve. 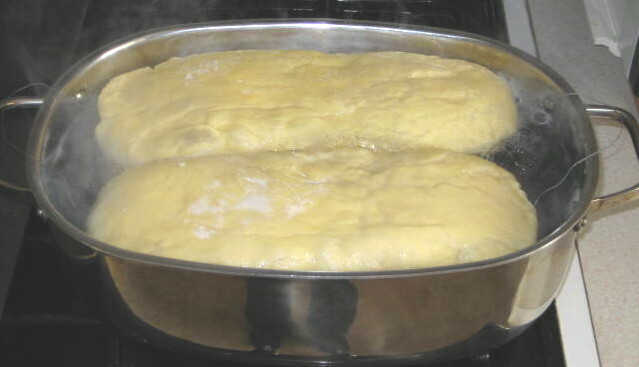 Bread dumplings are basically bread dough loaves that are boiled. 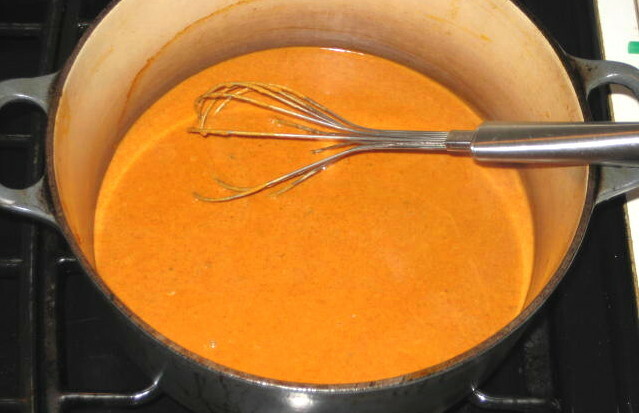 They are very soft and soak up sauces like a sponge. It is almost daily staple at Czech table just like pasta is at Italian table. This dish was so delicious. 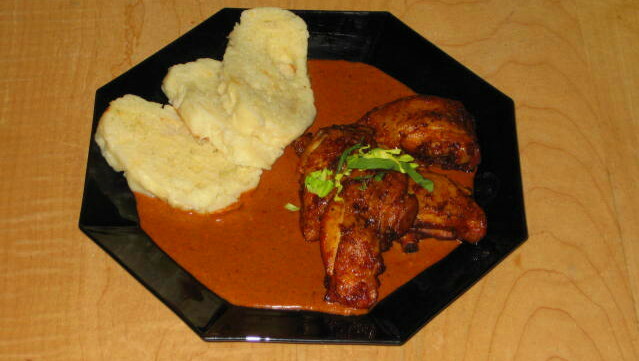 The sauce was creamy; the chicken was tender and tasty, the dumplings perfectly done. Just looking at the plate and all the flavors seemed to jump at you. The plating was so well done. That dish was total comfort for the palate.